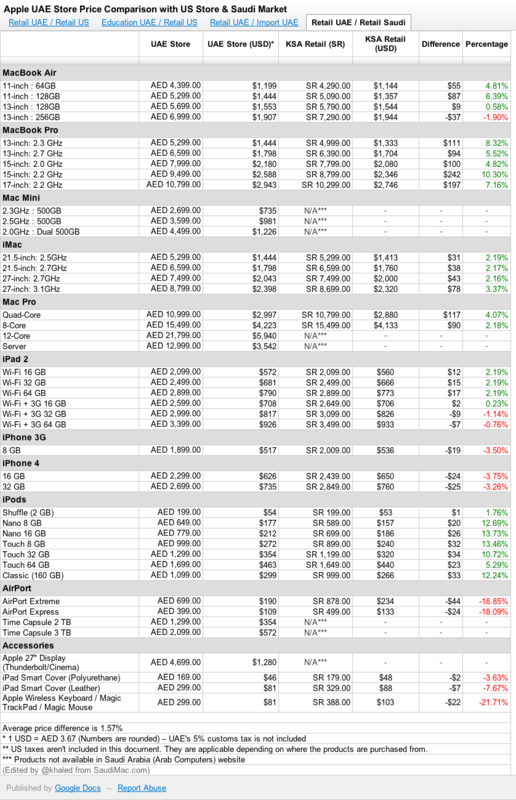 Rami Kayyali has compiled and compared the prices of products in the newly launched UAE Apple Store with the prices at the Apple US Store and Saudi Arabia’s distributors. The results are interesting even though the comparison does not include taxes nor custom rates. 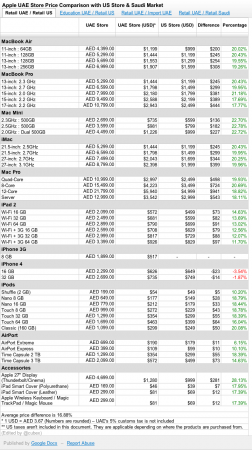 We notice that the iPhone 4 is the only Apple product priced less in the UAE than the US. 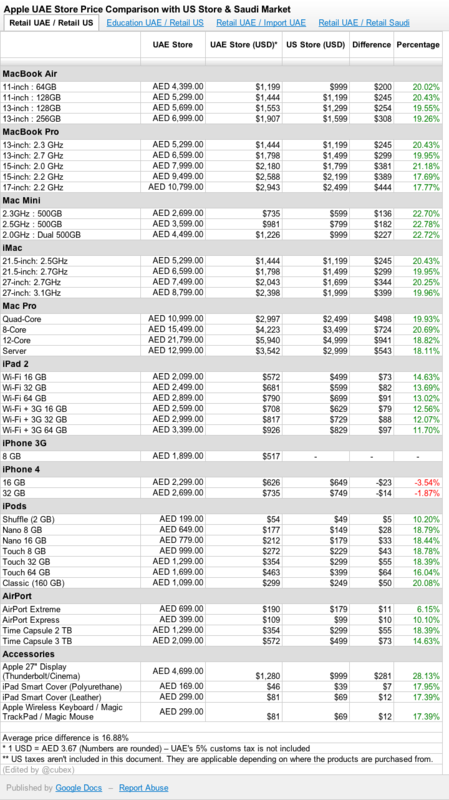 Apple should reduce the prices based on the local market. 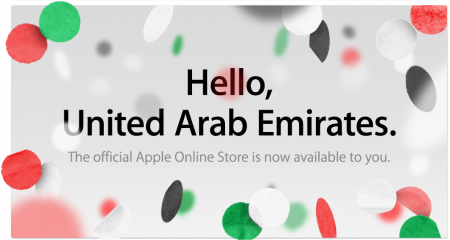 One more note: iPad 2, iPhone 4 and iPod touch 4 sold at the UAE Apple Store will end with model number AE so FaceTime (and possible iMessage) will be disabled. The full spreadsheet is available on Google Docs. my friend this comparison does not make any sense !!! 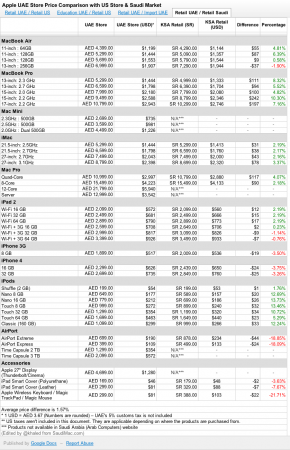 moreover; these prices of KSA or not correct at all !!! where can I get these prices ??? go to i-weaver and see how they double or sometimes triple the price !!! I’m an old mac user and I have never bought any thing from a local distributor!!! it’s been always way cheaper for me to buy from US, pay tax and shipping; yet I’m saving at least 25% !!! then how come the iPhone is the only exception? why is it the only item less in the UAE than the US? US sales taxes must be factored in to give a better comparison. Once that’s done the difference could be cut in half. Another thing to consider, if Apple are shipping these direct from the factory to the buyer, it’s natural to cost more than shipping it to the US because there isn’t and will never be the same volume of shipments to the UAE as there are to the US. Hussain’s got a point… if any of you are in retail, the idea of comparing us to the US is silly. That’s their HQ… primary customers… I love it when people compare to the US. to start off with, the Middle East probably doesnt even fall under the US, it falls under Europe. So you should compare to the UK. Take into account taxes.. then for those that talk of international prices, what about shipping, or the cost of your plane ticket to go and get this cheaper device. guy’s i need some help. im planning on buying a 2012 13″ macbook pro from saudi but right now all they have is the american keyboard macbook’s. these don’t come with arabic keys on them, so what they do is replace them. but the british keyboards do come with arabic, and so the macbook is never touched except maybe from the distributor ( Arab computers Ø­Ø§Ø³Ø¨Ø§Øª Ø§Ù„Ø¹Ø±Ø¨ ). My question is, if i buy the “american” keyboard macbook, would i face any problems in the futer due to the fact that it is an american machine. thank’s for the reply in advance.